Craig “Faketoshi” Wright and Bitcoin SV is running a variant of the Nigerian scam. Nigerian scams work because “by sending an email that repels all but the most gullible, the scammer gets the most promising marks to self-select, and tilts the true to false positive ratio in his favor.” [Cormac Herley, “Why do Nigerian Scammers Say They are From Nigeria”]. In other words, Nigerian scams work because it is a hyper efficient idiot finder. Only an idiot would engage with such a preposterous claim regarding a Nigerian prince. Most people will just ignore it, and this is good for the scammer because the scammer does not have to waste time engaging people with brains. Imagine if you were a scammer and you sent out a million emails. You don’t want to waste time corresponding with hundreds of people with normal intelligence, you want to find the stupidest of the bunch. Craig Wright is basically a Nigerian prince (or as per the title of this article, a Nigerian Nakamoto). 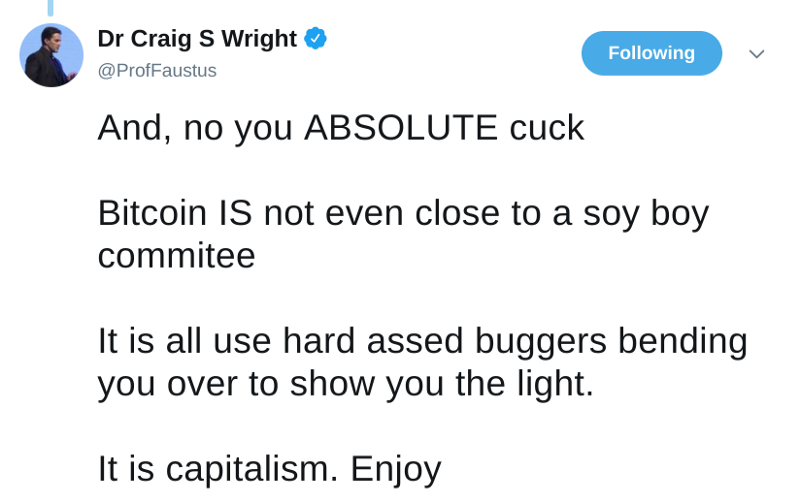 Only an idiot will actually believe that someone like Craig is Satoshi. He is in fact the exact opposite of Satoshi. A patent trolling, plagiarizer who uses 4chan insults and technobabble. It would be a mistake however to believe that Faketoshi himself is an idiot, he is not. He is merely playing a character that attracts gullible idiots. Craig was smart to position himself into the Bitcoin Cash crowd because he correctly deduced that they had the right combination of gullibility and liquidity. He saw that they were eating up ridiculous conspiracy theories that revolved around Blockstream. It would not be that hard to convince them that he was Satoshi, especially if he was on their side of the fight against Bitcoin. I suspect that people in leadership position within Bitcoin Cash like Roger Ver were smart enough to know that Craig was a fraud. However, they were morally bankrupt enough and too short sighted to reject him because they thought that he was on their side. I’m surprised that Ver has so far received almost no backlash from the ABC camp from this ordeal. He 100% enabled the SV camp from gaining credibility within Bitcoin Cash. If you are a Bitcoin Cash conspiracy theorist who believe everyone is a Blockstream plant, you have to wonder whether Roger Ver himself isn’t a Blockstream plant. Once Craig gained credibility within Bitcoin Cash, the next step was to splinter off the chain into Bitcoin SV. This step is equivalent to the phase where the Nigerian prince gives you a bank account number to wire the money to. 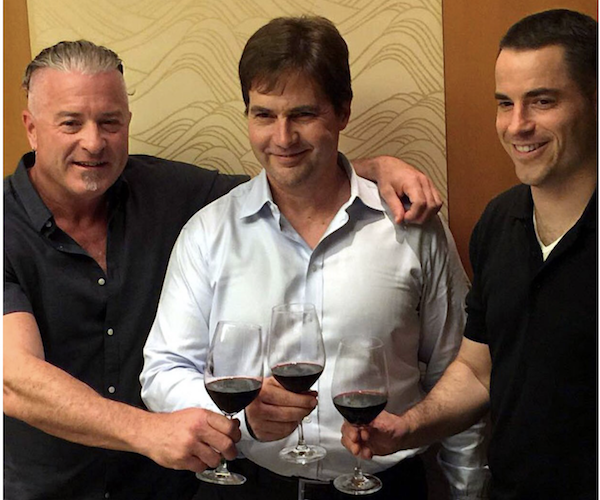 With the financial backing of billionaire and online casino mogul Calvin Ayre, Bitcoin SV was created. Before and during the chain split, SV made a lot of noise regarding a hashwar where they threatened to 51% attack the ABC chain. Many people took the bait and believed that there would only be one chain that would remain after the split. However, this was all just a marketing ploy to give legitimacy to SV. SV would gain nothing and probably lose by engaging in a hashwar against ABC which has the backing of mining giant Bitmain. What SV wanted was for the stupidest people within Bitcoin Cash to self select themselves onto a chain where they have 100% control. The next step is obvious. Once they have total control on the chain containing a bunch of stupid people that are members of the cult of Faketoshi, they are free to do whatever they want. Faketoshi has already hinted that they were going to be stealing burned coins, by changing the code to interpret them as miner rewards. There are also other creative ways to make money, especially if you control both the software development and mining on the chain. Bitmain showed that such a scheme was possible with their implementation of ASICBoost. I would also not be surprised if they decided to implement some inflationary scheme that enriches their own wallets at some point in the future. I think the mastermind behind this idea can be traced to Calvin Ayre, who made his money running online casinos. He sees the blockchain as a poker table. And there’s two sure fire ways of making money in poker and that is a) to make sure you are the house and b) that you are always playing against terrible poker players. POW mining is like a game of chance after all. Being able to fully control the software development enables you to be the “house” and set the rules of the game. Kicking out Bitmain into their own chain also allows them to be the biggest player on the table. Now the only task remaining is to steadily dump the newly minted SV coins. I suspect that SV will be very good at doing this because the crypto market is mostly just a large unregulated online market for people to gamble their excess money away. Calvin Ayre is an expert in that market, and Faketoshi gave him the best customers. 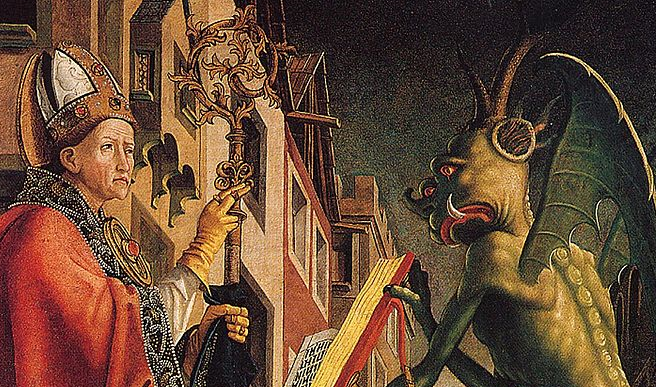 Bitcoin cash is facing a schism. Developers on Bitcoin ABC seems to be completely oblivious to this threat, hence they are proposing to hardfork over non critical matters on Nov 15th. It is not clear what the other BCH implementations like Bitcoin Unlimited and the new Craig Wright project Bitcoin SV intends to do on Nov 15th. What is clear is that there is a good deal of hostility (devs being banned from communication channels, Faketoshi posturing), and a high likelihood of Bitcoin Cash splitting into multiple chains. Various vulture chains have started to come out like Bitcoin Cobra and Bitcoin Stash trying to take advantage of the situation. The core foundation of any large group of people rests on ideology. 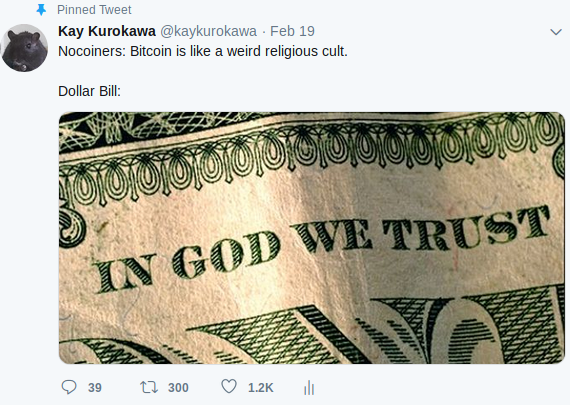 Nations, religions, and political movements cannot exist without ideology and neither can cryptocurrencies. Stable ideologies allow communities to thrive. A simple example in religion is the Christian tenet that “there is one true god”. This belief strengthens the religion because it weakens membership in competing religions. Communities with unstable ideologies will eventually collapse. Think of the Shakers, a 18th century Christian sect that endorsed celibacy as a core tenet. It should be no surprise that Shakers are now extinct because its members did not have children that could continue the practice of the religion. The very ideology that justifies the existence of Bitcoin Cash, also justifies the use of chain splits to settle any disagreements within the community. Its easy to see that this ideology, that a hard forked minority chain can be a legitimate successor to the original chain, is completely unstable. Witness below this profoundly confused statement by professional BCash shill David Jerry. 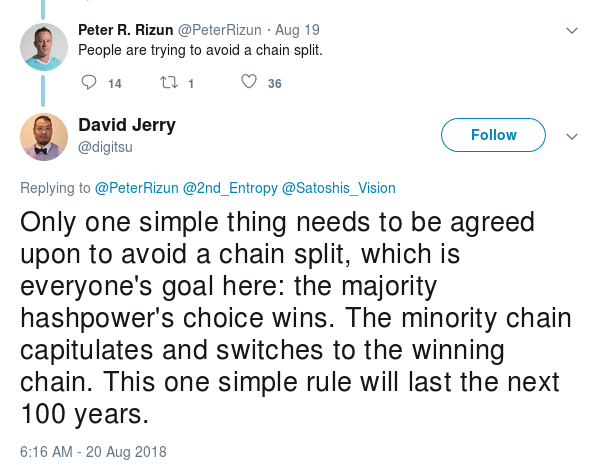 He proposes that to solve a chain split, the minority chain capitulates and switches to the winning chain, while not realizing that Bitcoin Cash itself is a minority chain to Bitcoin. While David Jerry’s solution is sensible in Bitcoin, it is completely incompatible with the Bitcoin Cash ideology. It is thus reasonable to conclude that Bitcoin Cash will face a never ending threat where its community members threatens to split off permanently from the main chain. I predict that within 1 year, there will be multiple competing hard forks that come out Bitcoin Cash. Eventually, the chain will have been split so many times that it will be a forgotten footnote in the history of cryptocurrencies. Now let us go back to the original debate which created Bitcoin Cash in the first place, the block size debate. Bitcoin Maximalists often say that the block size debate is not about the block size at all. 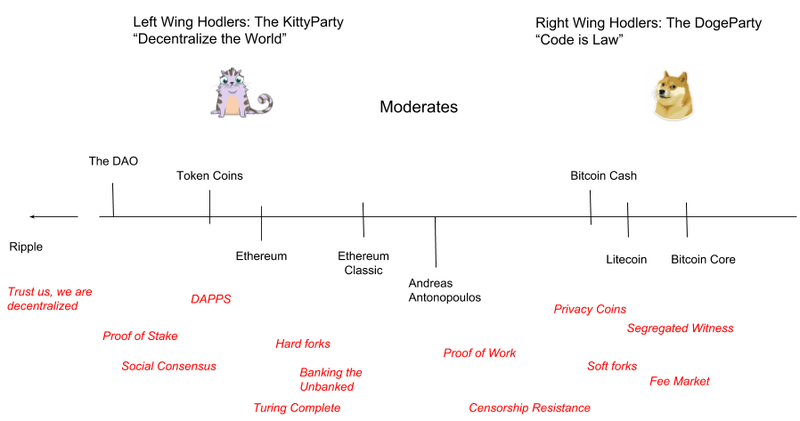 This is true, the block size debate is about retaining a stable ideology. The most important belief that the maximalists wanted to stand by in the block size debate is that backwards compatibility is never broken (or that we never hard fork). This ideology is stable because it guarantees that members who failed to upgrade their software are never dropped from network. This may sound like a rigid requirement for a software project, but Bitcoin is not just a software project. It is a method of coordination for a large group of people who face extremely hostile and powerful adversaries. Understanding this fact, it becomes clear that software upgrades can be a large attack vector and may not be feasible when the adversaries are fully engaged. Critics are correct in saying that currently, the state level adversaries are not fully engaged and that hard forks are completely possible in practice. What they don’t understand is the nature of ideology. Ideology can only be strengthened through strict adherence to it. A cryptocurrency project will not be able to easily switch to a policy of having no hardforks when the adversaries become suddenly engaged. For a project like Bitcoin Cash, which have already hard forked twice within a year to solve its problems, the users have been conditioned to believe that hardforks are safe. Thus when a malicious state sponsored hard fork comes along, they will be sitting ducks. Bitcoin users, who have been conditioned to believe that all hardforks are unsafe, will be immune when such an attack comes. A Stable and sustainable ideology must be the foundation of all cryptocurrencies. No amount of cryptography, consensus protocol development, and technical optimizations will help a cryptocurrency with an unstable and bankrupt ideology. This research has been sponsored by LBRY, a free, open, and community-run digital marketplace. Designing ASIC resistant proof-of-work blockchains, and particularly hard-forking to achieve such ASIC-resistance is a contentious new issue in the cryptocurrency space. ASIC chips are custom manufactured computing devices designed specifically for a particular blockchain or hashing algorithm. As such, they are far more efficient at mining than commodity hardware such as CPUs or GPUs. Forking to prevent such resistance, referred to as an AAHF (Anti-ASIC Hard Fork) for the rest of this article, changes the mining algorithm on a blockchain so that ASICs tailored to the old algorithm can no longer mine effectively. AAHF aren’t just theory. Recently Monero executed one and Zcash is pondering whether to do the same. At LBRY, we’ve received requests to hard fork due to the release of a Baikal miner appearing on the market (the miner is likely a FPGA machine, not an ASIC, however). The goals of this article is to look at verifiable data instead of speculating about the nature of the fork, and to see what kind of lessons we can learn from it. First let’s look at Monero’s hash rate before and after the hard fork. 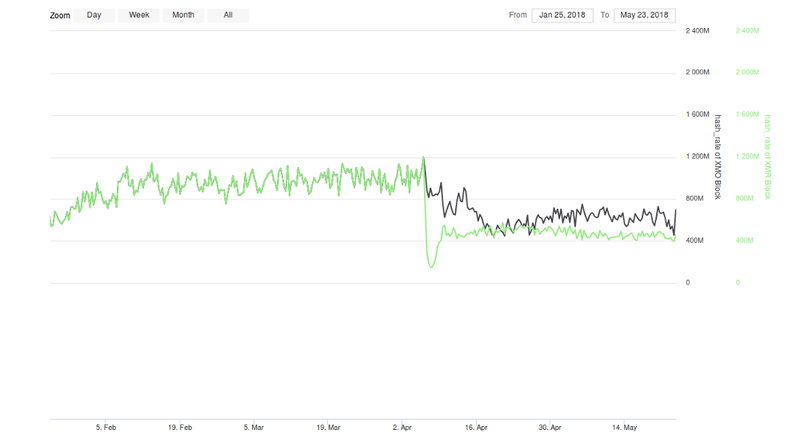 In the below graph, you can see the hashrate for Monero in green. The black line is the hashrate for the the various alt-coin splinter projects that took over Monero’s old chain after the hard fork (from henceforth called Monero Original)*. *Note that according to GPU miners that I’ve talked to, the pre-fork and post-fork Monero POW algorithm is equivalent in computational difficulty thus the hash rate before and after the fork should be comparable. One possible interpretation of this graph is that the total Bitmain ASIC hashrate is around 500 Megahash/sec. This matches up with the amount that seemed to drop off from Monero post-fork, and also matches up with the amount that remained on the Monero Original chain post-fork. However, we can’t say this with certainty that the above interpretation is correct since it is impossible to associate hashrate to a specific type of miner. Regardless of what the total hashrate of Bitmain’s ASIC miners is, losing almost 50% of the hashrate post fork should be a concern for Monero. The recent 51% attack of Bitcoin Gold illustrates the very real connection that exists between hash rate and security. We see that the Bitmain miner is 220 times more powerful than a single top of the line AMD GPU unit. More importantly, it is 40 times more energy efficient at mining. It is clear that commodity GPUs are outclassed by these custom miners, but it’s also important to note that there are a whole lot of GPUs out there in the world. Consider that AMD shipped 19.6 million discrete GPUs in 2017 alone. AMD does not release sale numbers for specific models, but if we assume that all 19.6 million of the GPUs sold were of the cheap 400 series variety, this adds up to 7.84 GH/s (a 400 series runs about 0.4 KH/s on the Monero network). This is 15 times larger than the 0.5 GH/s that we estimated to be the Bitmain ASICs total hashrate and the current Monero hashrate. The point of this calculation is to show that while AMD/NVIDIA may not produce profitable miners, the total hash rate they produce is immense. ASIC producers like Bitmain may be able to obtain monopolies on profitable mining, but they have not monopolized mining. If Bitmain tries to perform a 51% attack, the Monero community will likely be able to fight it off using commodity GPUs. If we assume that 0.5 GH/s is the correct estimate for the Bitmain ASICs total hash rate, this will require 1.25 million AMD 400 series GPUs. Assuming 150 watts of power consumption per unit and 12 cents per kilowatt-hour we get the energy costs to be 22,500$ per hour. The numbers will obviously be better if we use a higher end GPU. Software upgrades by nature are attack vectors. Some users will end up downloading a compromised version of the upgrade which may for example send all their coins to a hacker’s address. We can actually get download numbers for Monero 0 and Monero Original. They are two projects that took over the old chain after the Monero fork and released their binaries on GitHub (GitHub tracks download numbers through their API). About 1000 users total have downloaded either Monero Original or Monero 0 binaries and have presumably used them. I’m not suggesting that these binaries are malware but they are unsigned binaries from anonymous developers. Needless to say, there are significant risks involved in running such software. It is worth considering whether it is worth exposing users to such attack vectors when hard forking. Other users may not even be aware that the Monero network has hard forked and may be transacting on the old network unaware of what is happening. It is impossible to tell whether the transactions happening on the Monero Original chain are intentional or accidental but the below graph shows that there is still small amount of transactions occurring on the Monero Original chain (note that the Monero Original chain is traded on hitbtc.com so the transactions below could all be intentional). There are several causes for concern regarding Monero’s AAHF. The first concern is that the AAHF may have been unnecessary in the first place because the Monero community underestimated the total amount of hash rate that can be produced through commodity hardware. If the community had concerns about Bitmain abusing their powers, they certainly could have fought back without resorting to a hard fork. The second concern is that the AAHF created attack vectors that could be exploited against its users. The lowered hash rate can be used to 51% attack the chain, and the software update necessary for the hard fork may have left users on the wrong chain or exposed them to malware. It remains to be seen how these concerns will work out for Monero in the future. So far, things has gone smoothly as the Monero price has been stable and there has been no noticeable network disruption for the user. The market for the most part has deemed this AAHF to be a success. However, this AAHF is likely just the opening battle in a war to determine who gets to control the Monero network. Bitmain, and other ASIC manufacturer, will not be undeterred if there is money to be made. The next time this battle is fought, these concerns are going to be revisited again. IOTA is cryptocurrency that uses a Tangle instead of a “blockchain”. From https://learn.iota.org/faqs, “The Tangle as implemented in IOTA is the first public distributed ledger to achieve scalability, no fee transactions, as well as quantum-computing protection”. In this article, I will try to investigate how they achieve this claim and see how correct their claim is. I’m going to skip the “quantum-computing protection” part here because I’m not well versed in the topic, but let’s cover the two important topics. IOTA is proposing that the Tangle is a ledger that has “no fee transactions” and “achieves scalability”. These are two very contradictory statements because if there is no fee, there is nothing that prevents someone from spamming the network, and thus you have a ledger that grows out of control. Some shills have used “infinite scaling” ( https://www.iotasupport.org ) as a tagline, which is also a funny oxymoron. So how does the IOTA Tangle work? When creating a transaction in IOTA, you must assemble any two transactions that came before it, and attach a small proof of work to it. Therefore, the creation of a transaction necessitates a creation of a very small block with two other transactions on it. This proof of work is a small constant (presumably so that it works on small devices to enable the Internet-of-things) and does not adjust to the network hash rate. Ehh… what? What kind of crazy assumption is that? So basically what the whitepaper is saying is that the proof of work has to be difficult enough to prevent spamming, even though the difficulty does not adjust automatically. 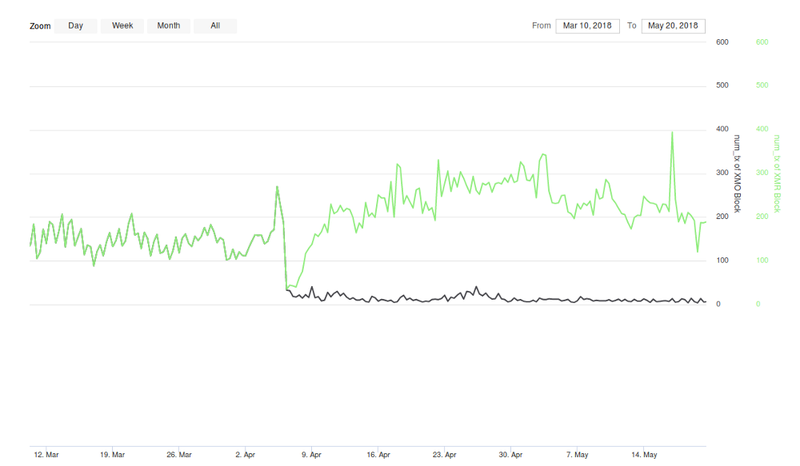 This means that the Tangle has to hard fork every time there is some drastic change in the network hash rate. Anybody who’s ever mined a cryptocurency knows that the network hash rate can abruptly change at any time, so this assumption is just plain wrong. Another problem with this assumption is that if the proof of work is difficult enough to prevent spamming, it will also be too difficult for your typical Internet of things(the single application that IOTA is supposed to be for) device to solve. After some looking and asking around, there seems to be another solution that IOTA is using to prevent spam attacks. The solution is the usual suspect when IOTA is being criticized and that is the central coordinator. IOTA’s central coordinator “decides” what is a spam transaction and removes it from being propagated through the network…. hmm doesn’t sound decentralized to me. I was going to bring this up with an IOTA developer, but it seems like I’m not the only one with this concern. Reddit user polayo expressed the same concerns about IOTA’s scaling when IOTA held its AMA, and an IOTA developer actually answered this question himself. His answer basically states “We don’t have an answer right now. We are going to research this, but for now snapshots is our answer”. So there you have it. One of the main developers of IOTA is admitting that the Tangle does not achieve scalability in its current state. Their two excuses are that a) they are relying on “snapshots” and b) its part of some ongoing research which nobody knows about and they are not going to disclose (if you believe this, I have some Bitconnects to sell you). “Snapshots” describe the state of a ledger at a certain time without you having to download the entire ledger. They are centralized solutions that relies on trust. Every time you download a snapshot you are putting yourself at diverging from consensus because you have to trust that you are getting the correct snapshot. Scaling is extremely easy when it doesn’t have to be trustless. Every cryptocurrency, including Bitcoin, scales just as well as IOTA’s Tangle if it relied on snapshots and hand-waved away the fact that snapshots are not trust-less (services like blockchain.info are essentially snapshotting services and no one's seriously proposing it as a scaling solution for Bitcoin). Skimming through the IOTA roadmap, https://blog.iota.org/iota-development-roadmap-74741f37ed01 , they refer to snapshots several times but there is nothing in place to tell us how they will remove their dependencies from snapshots. There is also no plan whatsoever to deprecate their central coordinator which they rely on heavily to keep the network going. In summary, when you strip away the fancy tech jargon like Directed Acylic Graphs, Internet of Things, and Tangle, what the IOTA whitepaper proposes is simple and fundamentally impossible. They are basically proposing that a blockchain with no difficulty adjustment can scale. When they actually implemented their system, they realized that this was impossible for an actual decentralized system so they implemented a centralized solution to fix it. Does IOTA achieve better scalability compared to other cryptocurrencies? No. Does it heavily rely on a centralized coordinator? Yes. Is there any plan in place to remove dependencies from the coordinator? No. "Replace by Fee" or RBF has recently received a lot of talk with the merge of “Opt in RBF” by the Bitcoin Core devs. Although there has been a lot of FUD and drama being spread on social media channels regarding the change, several noted figures in the Bitcoin community , such as Erik Voorhees from Shapeshift, and Chris Pacia from OpenBazaaar, have made valid and well written statements against RBF . Their main argument is that RBF makes it easier to double spend and will reduce the capabilities of Bitcoin businesses to compete since they can no longer rely on zero confirm transactions. I think this is a valid and pragmatic point, but here I would like to make the counter argument that Bitcoin businesses stand to gain a lot from the adoption of RBF, and give coherent examples of how Bitcoin businesses can utilize RBF to provide a better customer experience, and be more cost efficient. The businesses that stand to gain a lot from RBF are operations that must handle large volumes of outbound Bitcoin transactions, and must pay a large amount of aggregate transaction fees. This means exchanges, brokers (like Shapeshift), and payment processors stand to gain a lot from RBF. Operations like these want to pay the lowest transaction fee possible, but at the same time it must meet customer expectation of timeliness. They don't want to underpay the transaction fee because the transaction will take a long time to confirm, and they don't want to overpay the transaction fee because it impacts their bottom line negatively. This is a difficult problem to solve, due to the fact that transaction fees are not static, and will be increasingly more volatile as the Bitcoin mining subsidy is decreased and miners must rely more on transaction fees for revenue. We have already seen instances of high transaction fee volatility, due to the spam attacks on the network. According to BlockCypher, during the spam attack on 2015, July 8th , the average transaction fee went up 3 times, while the minimum transaction fee went up 25 times. Transaction fees are dependent on many factors such as available network bandwidth, available size of the mempool, the miners that are active at that particular moment, and the cost of operation for those miners. So spam attacks are not the only source of volatility for transaction fees. You could see unpredictable transaction fee increases when there is a large network outage that knocks out a bunch of full nodes, or when there is an increase in the spot price of coal in China that affects operation costs for Chinese Bitcoin miners. It is important to note that the volatility of transaction fee can not solved by increasing the block size. It may have an impact of lowering the transaction fee, but it will not make transaction fees static, due to the large number of variables that affects transaction fees as mentioned above. With RBF, Bitcoin businesses now have the capability to adjust their transaction fee on their outbound transactions in real time. This makes it far less likely for a business to overpay or underpay the transaction fee. This is easy to see if you look at RBF as a bartering process between the transaction creator and the miner. The transaction creator can start with a low offer, and progressively increase his offer until the miner accepts. This is much better alternative to the current “First Seen Safe” process where the transaction creator is stuck with the first offer he makes with no ability to make a better offer. The first offer could be flat out wrong due to the transaction creator's inability to estimate the required transaction fee, or some unpredictable event could occur immediately after the time that the transaction was created that impacts the required transaction fee. When we think of double spends, we think of people defrauding other users, but this does not always have to be the case. For example, people mistakenly send Bitcoins to the wrong address all the time with fortunes being lost in this way. I'm sure that many Bitcoin businesses past and present have also mistakenly created transactions that they'd like to take back. RBF gives you a time window where you can reverse this mistake (with some probability of success). Many honest mistakes are made all the time in mainstream financial markets, such as the six billion dollar “fat finger” screw up at Deutsche Bank, so institutions have rules in place to deal with the fact that human beings are prone to type in an extra zero or two. Bitcoin having a feature where transactions are reversible up to a certain time period is not necessarily a bad thing. It can protect Bitcoin businesses and their customers from their own mistakes.